Letter signed by Rebbe Avraham Yaakov of Sadigura, addressed to the directors of Kollel Volhyn in Safed. [Potik Estate], Iyar 1851. Written by a scribe, with the signature of the Rebbe of Sadigura: "Avraham Yaakov son of R. Yisrael". The letter pertains to the Eretz Israel monies the Rebbe is sending for members of the Kollel in Safed, Tiberias and Jerusalem, and includes the Rebbe's detailed instructions regarding the allocation of the funds. The Rebbe further requests that the individuals receiving the donations should be particular to send receipts promptly to the philanthropists who had sent them the money. 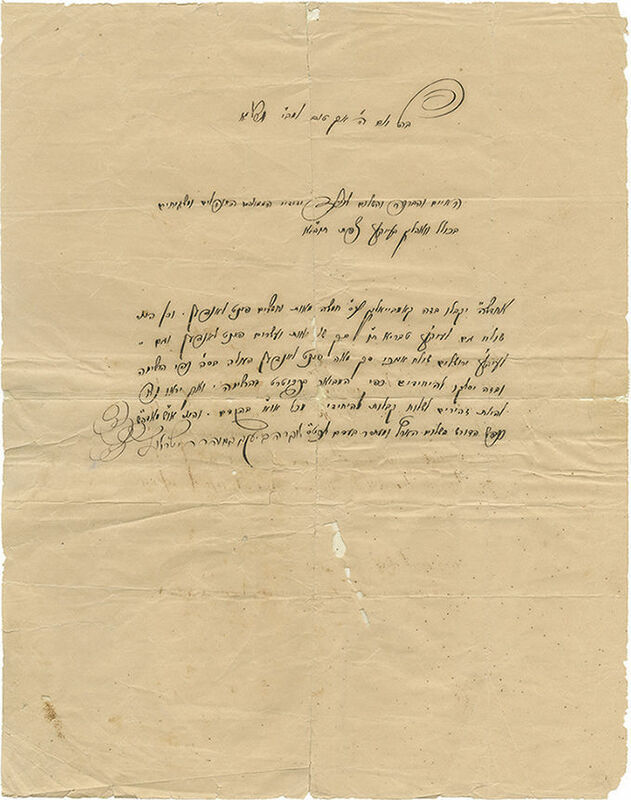 This letter was written within the year following the passing of his father R. Yisrael of Ruzhin in Cheshvan 1850, prior R. Avraham Yaakov's appointment as rebbe. This letter was presumably written in Potik Estate, before he reached Sadigura (Encyclopedia L'Chassidut, I, p. 108 relates: "After the passing of the father in 1850, all six sons remained in their father's estate in Potik. That same year, the eldest son R. Shalom Yosef of Ruzhin passed away. For the High Holidays of 1851, R. Avraham Yaakov was summoned to Sadigura, henceforth residing there, and he became known by that name". He presumably reached Sadigura sometime in 1851-1852. See: David Asaf, Derech HaMalchut, p. 455). Rebbe Avraham Yaakov Friedman (the first) of Sadigura (1819-1883) was a prominent Rebbe and Jewish leader in his generation. He was the son and successor of R. Yisrael of Ruzhin in his Beit Midrash in Sadigura (Sadhora), the son-in-law of R. Aharon of Karlin the Beit Aharon, and from his second marriage, of R. Menachem Nachum of Shtefanesht. In Elul 1851, he was appointed Rebbe of Sadigura, in place of his father (who passed away in Cheshvan 1850) and of his eldest brother R. Shalom Yosef (who passed away Elul 11, 1851). He served as rebbe for close to 32 years, leading a court of thousands of Chassidim and pious men. Many flocked to receive his blessings, guidance and counsel. He concealed his holiness, and only by chance was it revealed that he dealt extensively in assisting deceased people attain a reparation for their soul. He conducted himself with majestic opulence and lavishness, as was customary in the Ruzhin dynasty, yet he himself was holy and ascetic, eating so little that his intestines shriveled up. He stood at the helm of Orthodox Jewry of his generation, and joined Rebbe Yehoshua of Belz under the Machzikei HaDat organization in Galicia. At his initiative, the magnificent Tiferet Yisrael synagogue in Jerusalem was completed. In his public activism, he maintained ties with prominent figures in international politics, including Sir Moses Montefiore and the British diplomat Laurence Oliphant, who came to Sadigura specifically to meet him (see David Asaf, Derech HaMalchut, p. 456). He suffered the Russian government's persecution of the Ruzhin dynasty, and after he addressed a letter to Montefiore requesting his intervention in saving Russian Jewry from the Russian Tsar, he was denounced to the government of the Austro-Hungarian empire under trumped up charges of counterfeiting money, which led to his incarceration for almost two years (between 1856-1858). leaf. 29 cm. Fair condition. Tears to folds and wear, with slight damage to text. Repairs with (acid-free) tape to verso. Stains.